How do I establish a realistic budget for my kitchen update? The first step in kitchen or bath update should be to establish your budget. A recent issue of Consumer Reports: Kitchen Planning Guide recommends a budget of between 10% – 20% the value of your home. One way to determine which end of that spectrum your budget will fall is by considering the scope of your project. If you’re thinking of keeping your flooring and the basic footprint of your kitchen, stay closer to the 10%. If you plan on moving walls, replacing your flooring, adding a skylight, etc. your budget will probably land closer to the 20% range. Your budget and time frame goals should be established first. A good designer will help you put together a budget if you don’t have one and can even show you ways to make the most modest budget go the farthest with their skills and connections . But you must create a budget and stick to it! If you were building a house, you would use an architect. In the remodeling business, we need to create a kitchen or bath floor plan, elevations and dimensions. Then we need to plan the space out according to how you will USE it. Plan an In Home Consultation with your kitchen designer. Tell them how you like to work in the kitchen. Where is your prep area? Do the kids hang out and do homework while you are cooking? Do you entertain a lot? Aesthetically we can make your kitchen beautiful. But what you will remember is how much more functional it is if it is laid out with good space planning from the start! What is the difference between plywood construction and particle board (MDF board)? Particle board is a composite sheet wood product. The sheet is made by combine wood particles with a binder and either shaping via a mold and press operation or continuously pressing process. Since the sheet is a composite of wood fibers, there is very little directional movement. Particle board products are classified by their particle size and overall density. The higher the density the heavier the product, in general terms. Additionally, sheet products have grades based on quality control standards set by the industry. Exposed surfaces can be finished with either wood veneers, painting if the material is suitable, or a laminate low pressure melamine. Which is better in Plywood vs. Particle Board? Unfortunately, the answer is “it depends”. Both products have features and benefits and there is no real winner in the head to head match up. Weight – Plywood has a lower weight per square foot. The weight advantage is not a major benefit to the consumer except in certain specialized installations, wall hung vanity cabinets or large hung units. Dimensional Stability – Particle board and more specifically MDF (Medium Density Fiber Board) has a greater level stability. In the carcass construction the more stable the material the better. To the consumer this becomes a major benefit in painted finishes. Most highly finished doors are MDF because of its stability. Moisture Resistance – Plywood has the advantage. Plywood will be damaged by long term exposure to water, but the failure is longer in the cycle due to roting rather than structural failure. Particle board has a tendency to swell and lose structural strength quicker and with less exposure. Construction Longevity – Plywood holds mechanical fasteners (nails, screws) better than particle board. Additionally, plywood has greater effectiveness in holding glued joints. A glued joint has much better physical properties than a mechanical joint. Higher end cabinets will have glued construction. Surface Quality – Because of the process used to make particle board, its surface is better for paints, lacquers, and exotic veneers. MDF is generally accepted as the standard product for highly finished doors. Cost – In very general terms particle board has the advantage in costs. The process and volume through put of a particle board production line is higher than plywood line. Also the basic feed stock for particle board is less expensive, because the material is often considered waste. Many plywood manufactures also have particle board lines to utilize waste product from their plywood lines. Depending on the cabinet manufacturer the cost savings by using particle board box construction ranges from 7% to 20%. Green Benefit – For this particular discussion we are going to speak very briefly in terms of the glues used to make the finished sheet. “Green” products are products that do not introduce or emit toxins into the environment. The environment has several meanings. The first is in the broad sense, the global environment. The second is the local environment in which the product is placed. The glues used to make both plywood and particle board contain urea formaldehyde. The gases released over time from these sheets have been tagged as an environmental risk factor. Both plywood and particle board products used in modern cabinet manufacturing have certain level of these gases, unless specifically noted by the board manufacturer as being NON-urea formaldehyde based. Plywood cabinetry has a slight edge in this category, because there is less glue per square foot of finished product and therefore less potential off gases. However, there are several issues in the current market that doesn’t make this decision cut and dry. The importation of plywood from Asia and has caused concerns, because the higher allowable level of formaldehyde in foreign countries. Domestically produced board products are better choice in either construction method. **Note to the consumer** If cabinet company offers a plywood cabinet cheaper than a particle board cabinet, ask about the origin of the plywood and make an informed decision with all of the facts in hand. Eco-Friendly – Good environmental stewardship is must and we urge everyone to take a role. The edge goes to particle board in this category. Because particle board is not dependent on large veneers, less desirable cuts that would not be used in plywood production can be used making it a bit more efficient. Also particle board can be produced from alternate fiber sources such as wheat, removing the need to harvest forest completely. However, there are a multitude of factors in the calculation and plywood has some strong points to be made such as farmed wood products and alternate veneer sources like bamboo. Eco-friendly has many meanings and the definition will continue to evolve over time. Strength – Plywood has a marked advantage over particle board in tensile and shearing properties. In compressive strength plywood still has the advantage, but not as large. When comparing carcass construction styles, there are many factors to consider and neither product has a clear advantage. You, the consumer, should look at your needs and make the determination which physical properties are the most important and balance those requirements against your budget. 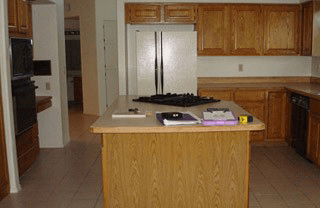 Do I need to hire a General Contractor to do my kitchen remodel? No you do not need to hire a General Contractor (G.C.). 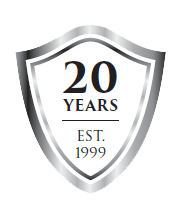 We are licensed, bonded and insured which means we can be your G.C. That being said, we can do as little or as much as you want us to do. From tear out to completion of your remodel. We can also help coordinate your calendar while you’re gone on vacation so you don’t have to live in the construction! Some clients prefer to do their own demo, or paint their walls to help with their budget. We will make sure that we establish who is doing what before we start so everyone is on the same page. How do I properly clean and care for my cabinetry? Regular exterior and interior cleaning requires only wiping with a damp cloth and then drying. Remove oil, grease or general soil using a clean cloth dampened with a fresh solution of mild soap and water. Rinse with a clean, damp cloth, then dry thoroughly. Wipe spills immediately. Prolonged exposure to spills, including food, water or other liquids can cause permanent discoloration or damage to your cabinet’s finish. Avoid using harsh detergents, strong soap or abrasive cleaners. All can damage the factory-applied protective finish. Never hang damp towels over cabinets to dry. Excessive moisture will damage the finish. For regular cleaning, always use a cotton cloth or non-abrasive sponge and wipe with mild dish soap or with a 50/50 mix of water and Simple Green®, especially on oily or tacky surfaces. To clean stains, always use a damp cloth or non-abrasive sponge and wipe with a 50/50 mix of water and Simple Green®, scrubbing lightly for 10 to 20 strokes. This should remove most stains. Avoid harsh household cleaners and abrasives. Always check the active ingredients of your cleaners to be sure there are no potentially harmful chemicals. Avoid paper towel, brushes, scourers and scrapers. 1. Gather a scrapbook of notes, photos, and articles that you have collected. 2. Get together with your family and ask them for their input and wish lists. 3. Come up with a budget you can live with. 4. Draw a rough sketch of your floor plan and take measurements (or, if building, get floor plan from architect or builder). 5. If you would like, print and fill out the Kitchen Planning Guide. 6. Call us to make an appointment, or stop into our showroom. Can I reuse my faucet & sink? In most cases it is best to get a new faucet & sink. Especially if you are considering a new countertop . In most cases you will need an undermount sink but vessel sinks and continuous surface sinks are also very popular. Visit our section on Design Tips for more sink choices. What should you look for when shopping for kitchen cabinets? 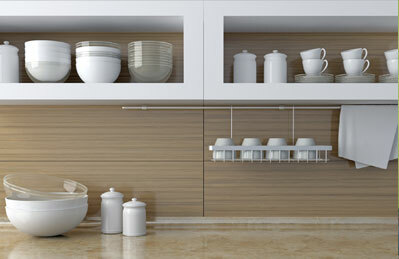 Cabinetry is like any other product you purchase. From cars to clothes there are differences in features, finishes and craftsmanship. Before you purchase your cabinets, inquire about the specs and warranty of the cabinetry. Drawers: Look for wood dovetail drawers. It’s the mark of furniture quality drawers that will hold up over time. Shelves: ¾” thick shelves. Less than that and your shelves will likely sag. Hinges: The Blum concealed 6-way adjustable hinges are our preference. Drawer Guides: Blum under mount ball-bearing full extension with soft-close drawer guides is good. These guides support 75lbs as a standard. Construction: All-plywood construction is preferred, but particle board with melamine is just as sturdy and will save money. Sides: You’ll want the side walls for your cabinet to be at least ½” thick. Less than that, and it won’t support the weight in the cabinets, let alone the weight of the countertops (especially granite). What’s the best counter top to use? Lots of choices! 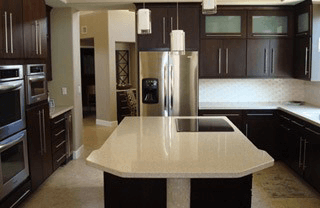 Most popular are: Granite, Engineered Stone (Cambria, Ceasar Stone, Silestone) , Corian, HiMacs, Concrete, Ice Stone…check out our Design Tips section for more information on choosing the right counter top for your needs. Is it important to use a licensed contractor? Yes, you should always use a contractor registered with the R.O.C. in Arizona. We are licensed, bonded and insured with an A+ rating from the BBB. 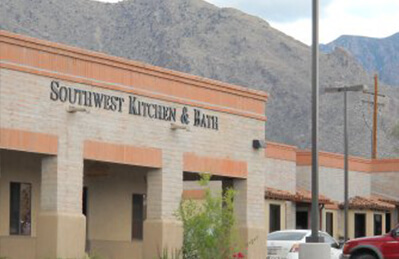 Always check references, see what clients have said about their experience with Southwest Kitchen and Bath. Do you do in-home consultations? Complementary visits are easily scheduled by calling – (520) 531-9187 or by filling out our online form.